I'm taking a short break from vintage recipes to bring you a collection of tried and true holiday treats while there's still time to make these. 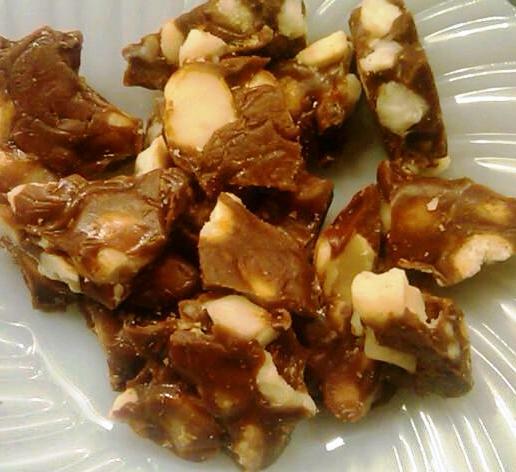 First up is macadamia nut toffee, the most addicting candy ever. Is there anything more delicious than the buttery flavor of macadamia nuts, especially when they're embedded in a dark, caramel flavored toffee? 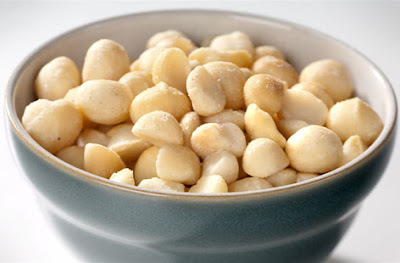 These treats only have four ingredients -- heavy cream, sugar, nuts and corn syrup -- and they do seem like so much more than the sum of their parts. Get our your candy thermometers and create! Line a cookie sheet with parchment paper or, if you have a marble slab, oil it lightly with neutral vegetable oil. Have a sheet of parchment and a rolling pin standing by. Stirring the candy. Don't be tempted to turn up the heat, even if it takes a long time to reach 284 F.
Combine the first three ingredients in a heavy saucepan large enough to hold four times the volume of these ingredients (otherwise it will boil over). Bring to a boil over slightly hotter than medium heat while stirring to dissolve the sugar.Continue boiling without stirring until the mixture turns a pale golden color, and from this point give it your undivided attention. 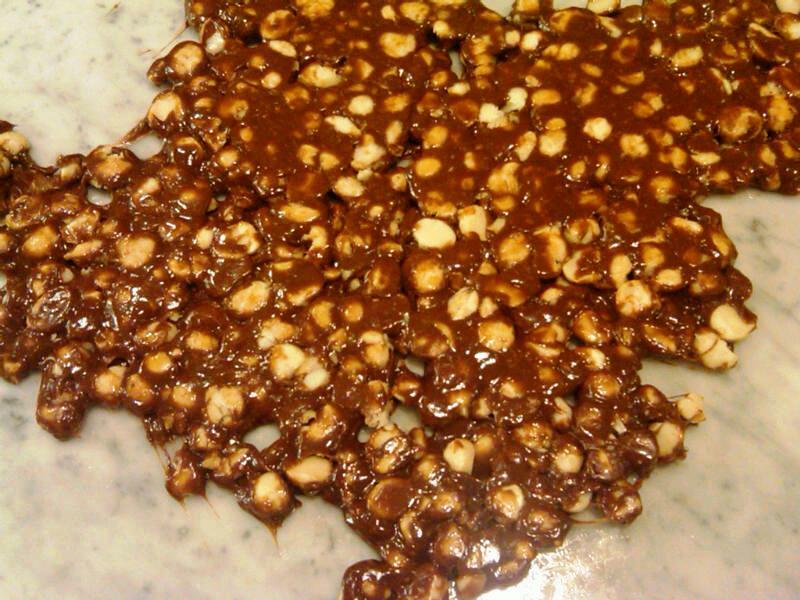 Stick the candy thermometer in the pan. Using a wooden spoon with a flat edge, stir occasionally at first and then constantly as the temperature approaches 260 F. Keep boiling and stirring until it reaches 284 F.
Rolling out the candy. It stiffens up quickly, so you have to work fast. 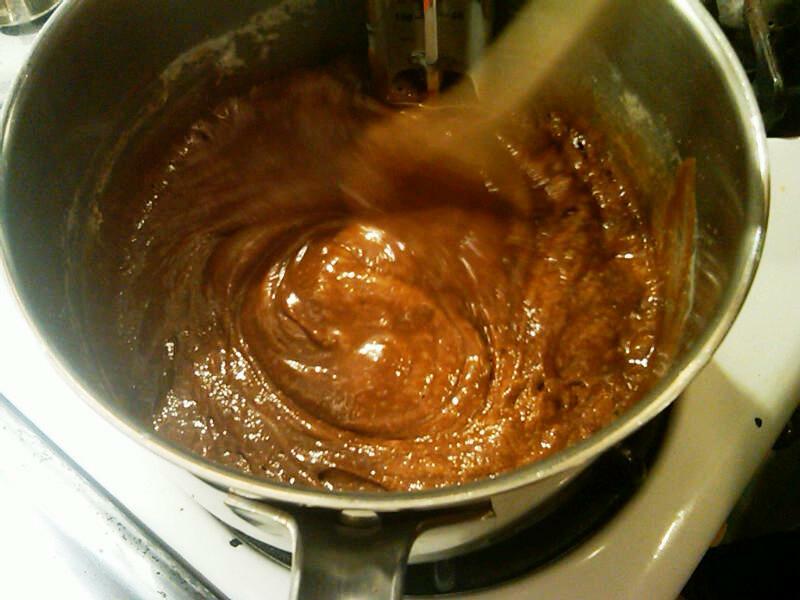 Turn off the fire and dump the nuts into the pan, stirring vigorously as the mixture will stiffen quickly. When well combined (gotta work fast), dump the whole mass onto the prepared cookie sheet or marble slab. 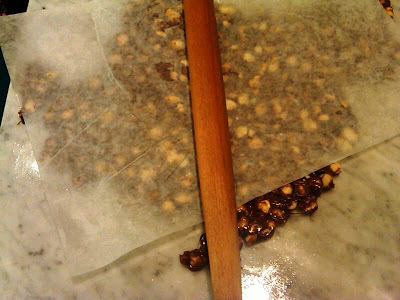 Place the sheet of parchment over the toffee and roll it out with the rolling pin til it's about 3/8 inch thick. Let cool completely and break into irregular shapes. Store in an airtight container, well hidden, lest the Christmas candy crack addicts discover them and they all disappear. The sheet of candy, cooling on the marble slab.